Team Orange Triangle tasted early season success with a finish at the newly-lengthened 24-hour GMRAS race. Staff for this race included John Chase, Randy Bauer, Ray Daniels and Annie Dickerson with Jerry Bauer and Kelly Rahn running support. Set in western Illinois, the course was intended to include a long section of paddling on the Mississippi, but things don’t always go according to plan in AR, even for the organizers. At the pre-race briefing, the course was presented in four parts: biking, canoeing, orienteering and the final return which would be a bike-creek walk combination. After suffering freezing conditions of 35 to 40 degrees and rain in last year’s 12 hour race, TOT came to the line prepared for the cold. Little did we know that conditions would actually be worse in 2003. The rain started as we mounted the bikes at 1:30 pm for a short tour through Mt. Carol, Illinois and it would continue at rates that varied from a sprinkle to a sleety downpour for the remainder of the daylight hours. During those hours, we biked some 60 or more miles up and down the stream-cut valleys of the area, hitting 7 check points before our first transition. At each CP during the bike leg, organizers had a short off-bike exercise waiting for us. At the first it was a simple walk in the woods following red flags to the control punch. At another it was climbing the stairs up a 60-foot observation tower to the waiting crew. A third sent us on a nighttime zip-line ride over a wide stream. As darkness descended, the rain stopped for while, only to restart as fine flakes of snow that would continue for much of the night. On what we expected to be the final leg of the bike course, we meandered in and out of the various cross-country and down hill runs at the local ski resort before arriving in transition at about 1 am. Ministrations from Jerry Bauer and Kelly Rahn were a welcome and essential element-without them we wouldn’t have gone much further. At this point, we discovered that the river canoeing had been cancelled due to high winds and cold temperatures. 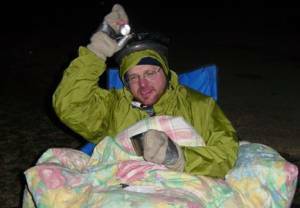 Instead of a long cold paddle, we were put back on our bikes for another 20 snowy miles of riding before the “O” course. The O course was long: 13 kilometers straight line, and probably 15 miles or more of actual walking. We had an advantage over many of the leading teams as the sun came up before we reached the second of the 18 control points. At the third point in the O, we got to haul out the climbing equipment (while dodging falling rocks) and then ascend up a 25-30 foot rock wall. The remainder of the O points were easily found in the leafless woods of the Mississippi Palisades State Park, but the layout was such that the entire trek resembled a Stairmaster workout. After about an hour’s ride, we reached the beginning of the creek walk. While we had debated bringing trekking shoes, we decided to do this leg in bike shoes instead-hoping in vain that we’d find a way to keep our feet dry. Of course this was not to be. Our orders were to follow a line of red flags that waggled back and forth from bank to bank as we proceeded up the river to the finish line. Finally, there was a cluster of five flags marking the control point and it was set beyond a deep pool that meant a quick, cold swim for our designated volunteer, Annie. As we approached the finish, we caught sight of another team gaining on us and stepped up the pace, running pell-mell over rocks and up the steep hill leading into camp. We finished at about 4:30 pm on Saturday, some 27 hours after the start of the race and with a real flush of triumph. The race had been challenging both physically and mentally, and that made it both satisfying and fun to complete. A big thanks to Jerry and Kelly for support-their help was essential to completion of this course.